What is it? Well, it’s my garden. Getting a little too big; yes maybe. That’s why I dig plants for visitors while they wait, take orders and deliver locally, or dig and ship my plants for you. My goal is to make my garden; and yours, more and more beautiful. Our set-up is a little unconventional. The majority of our daylilies, hostas, iris and perennials are kept in the ground until they are sold. Visits to the main garden are welcome, by appointment, but we also grow plants in multiple “host gardens”. Everything that we have is grown without chemicals. We grow it all ourselves; harvesting, cleaning and packaging everything by hand. These are full sized plants, not small starts. We want you to be happy with what you receive from us. If you are not pleased, let us know and we will do our best to make it right. I try to specialize in the unusual, but I do have my all-time favorites. 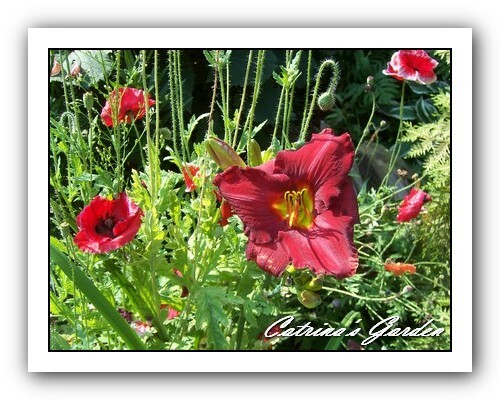 Much of our garden success is what works for you in your special place in the world. Here in Wisconsin it is cold, with a very short season and kind of dry. Our plants are chosen to thrive in northern gardens but most of these hardy plants do well in southern climates too. If not we will mention it in the description. Catrina’s Garden is a licensed grower in Wisconsin. The garden is more than just plants however. It’s products that come from the garden; hand crafted things, gourmet foods and specialty crops.